Air Mouse Pro. iPod Touch Apps, Do you love doing things on your computer, but don’t actually want to be tied to your computer every minute? Maybe you love watching movies on your computer from your TV, or you like to listen to music on your computer, without having to go back and forth every time a song you don’t like comes on, or when you need to adjust the volume. Now, you don’t have to get up and still enjoy the many things you can do on your computer. 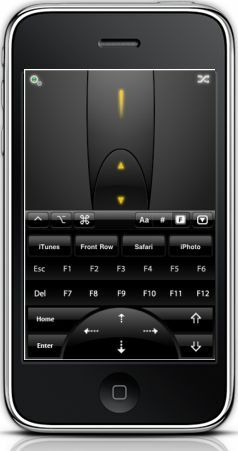 Because, with Air Mouse Pro for the iPod Touch, you can turn your iPod into a remote control for your computer, letting you do whatever you want with just a few taps. The Air Mouse Pro iPod Touch App displays an actual computer mouse with both left-click and right-click buttons. So you can control it just as you would if you were sitting at your desk. You can change your privacy settings, browse the Internet, check your email, and do whatever else it is that you need to do on your computer, all while sitting on the couch! The app even comes with a keyboard that can be displayed in either landscape or portrait mode and gives the user even more control over what they’re doing. Unfortunately, the Air Mouse Pro app for the iPod Touch does not come free of charge. But, at only $1.99, you’ll soon find that it’s worth every penny spent, and wonder how you lived without it before! Now you don’t have to. You can buy it here.